Phony McGregor Khabib Fight Setup for Khabib Vs Mayweather? 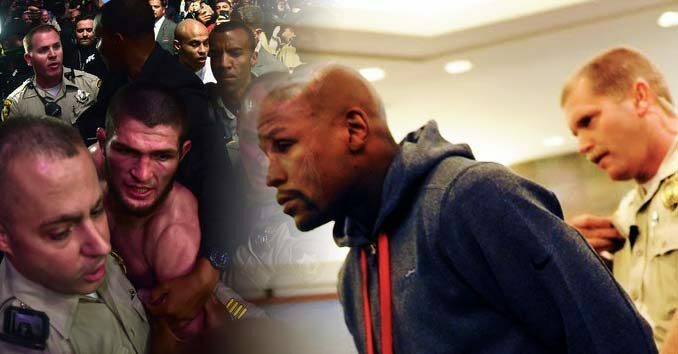 It seems like The Nevada Athletic Commission’s fake 10-day suspension isn’t stopping the next phony fight from happening as it looks like a Khabib Nurmagomedov vs Floyd Mayweather Jr. bout is in the works. Yesterday, Khabib challenged Mayweather to a fight; of course, this was done via an Instgram Video with Leonard Ellerbe, CEO or Mayweather Promotions — not suspicious at all, right? So it looks like Las Vegas can expect another fake crossover fight and even more chaos heading to strip thanks to the Woman-beater Mayweather and the president of the WWE — oops, we mean UFC — Dana White. This is all one big show! None of it is real; but sadly, the casinos will play along, people will be milked out of money to bet on a fight that really isn’t a fight, and the city of Las Vegas will pay once the after-fight violence inevitably erupts throughout the Strip.